PR practitioners and professional communicators at organizations and businesses are often experts in building good relations with journalists and other influencers that can help get their messages across to the target audience. Reading and monitoring traditional media has always been an essential part of the daily routines of PR professionals, we need to know who says what and where. With the strong growth in comsumption of social media, one would assume that most communicators had started to use social media by know, but according to a survey by Cision, there is still room for improvement. Cision conducted a survey of journalists and professional communicators in Denmark, Finland, Norway and Sweden about their attitudes to and use of social media. The survey revealed that journalists are becoming heavy users of social media such as blogs and micro blogs (like Twitter), especially in Sweden. As many as 42% of Swedish journalists and 26% of Danish journalists read blogs daily. In Norway and Finland the figure is slightly lower, 19% and 16%, respectively. 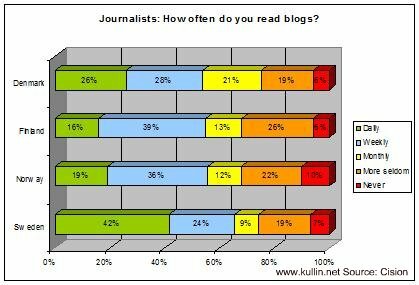 53% of Swedish journalists read blogs for research and 28% say that they blog as part of their work. Twitter is a lot more popular among journalists in Norway and Sweden, where one in four read it daily (27% and 25%). 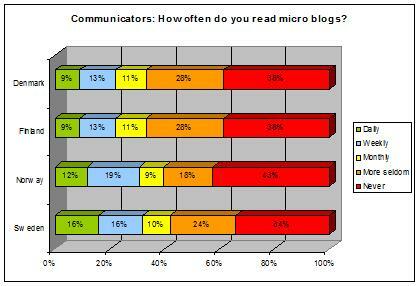 In Finland, only 4% read micro blogs daily. 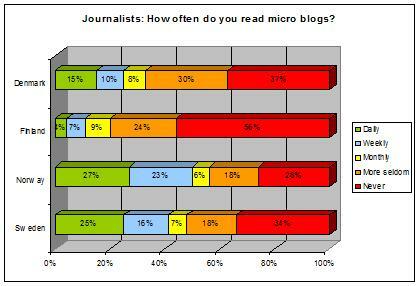 17% of Swedish journalist write on micro blogs daily. 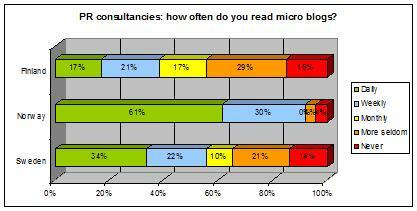 When asked “how do you work with micro blogs?”, 36% said that they monitor what is written, 36% follow interesting people, 25% publish news, 21% build relationships and 21% read for research. 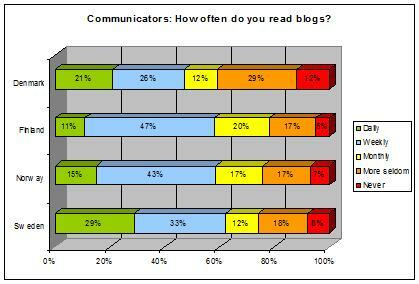 Among communicators, it is more common to read blogs in Sweden and Denmark, at least on a daily basis. Communicators in Sweden and Norway are the most frequent users of Twitter. If we compare the use of blogs and Twitter between journalists and communcators in each country, we find that a larger percentage of journalists read blogs on a daily basis. This is quite interesting because it could signal that journalists are better connected to the blogosphere than professional communicators. And if as many as 53% of Swedish journalists read blogs for research (35% of Danish and 33% of Norwegian journalists) then communicators probably should put even more focus on building relations with bloggers. Journalists are also more frequent readers of Twitter than communicators, with the exception of Finland. If for example 50% of Norwegian journalists read micro blogs at least weekly, why are only 32% of communicators doing the same? Shouldn’t they be out there to monitor and connect with influencers on Twitter? Well, I think so. Fortunately for communicators, there are people that they can turn to for advice, namely PR consultants (yes, people like me…). It turns out, not very suprising, that the individuals that uses social media most often are PR consultants. 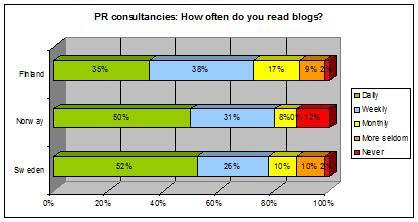 52% of Swedish PR consultants read blogs daily, 50% in Norway and 35% in Finland (not enough responses in Denmark). 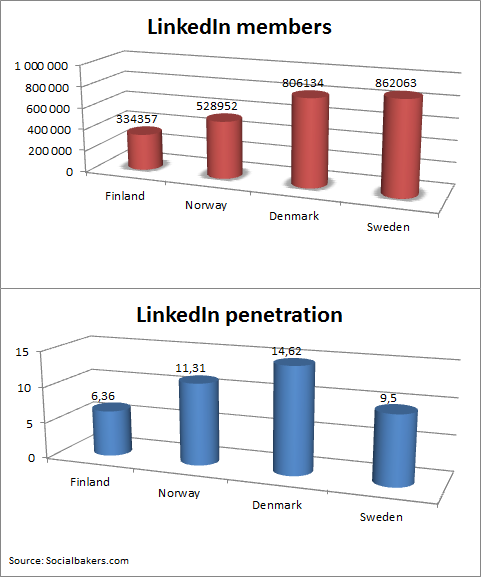 As many as 61% of Norwegian PR consultants read Twitter daily, 34% in Sweden and 17% in Finland. Footnote: The report Cision Social Media Survey 2010 can be downloaded here. Tags: twitter, journalister, pr, sociala medier. Ping. Finland’s largest daily, Helsingin Sanomat, today became the first paper in the country to connect online articles to blog comments via Primelabs’ service Twingly. Martin Källström, CEO of Primelabs, says that the company currently tracks 35,000 Finnish blogs. The Finnish based virtual community site Habbo Hotel has launched a social networking feature, Habbo Home. Habbo Home will enable users to build and customise their own home page or profile page and interact with other users writes Brand Republic. Habbo has more than 64 million registered characters in 29 countries. I have compiled a list of more than 80 RSS feeds for Nordic media. Included are also press releases RSS feeds. I haven’t tried all of them and can’t guarantee they are working. UPDATE: I have added 11 feeds for alternative publication Stockholms Fria Tidning. A reflection, how come that it is alternative media and the really big giants that are experimenting with RSS, but few players “in between”, like trade publications?